MANKATO  The staircase leading to the top of Good Counsel hill has 240 steps. Jim Wiese knows. Hes counted them several times. 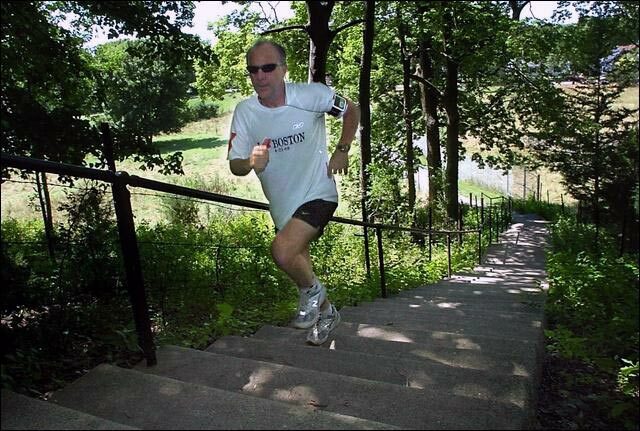 The north-side resident and marathon runner will run up and down the steps eight or nine times during one of his training sessions. While that might seem like a grueling workout, it doesnt begin to prepare him for the race he will run this morning in Colorado. By his estimation, the Pikes Peak Marathon will be Wieses 24th 26.2-mile race  and his toughest. The Pikes Peak Marathon is exactly what youd expect it to be. A 13-mile run up the mountain and a 13-mile run down. Jim Wiese runs up the 240 stairs that lead to the top of Good Counsel hill as part of his training for today's Pikes Peak Marathon in Colorado. The description on the marathons official Web site doesnt necessarily dispel that theory. Runners climb 10,000 feet in the races first 10 miles. Over the next three miles, they go up 2,000 feet but are above the tree line and in thin air where they average about 30 minutes per mile. When the race begins in Manitou Springs, Colo., its about 60 degrees. At the end of the race, its around 90 degrees at the bottom. The top of the mountain is a different story. In 2004, runners were met with as much as eight inches of snow on the mountains peak. A year later, hundreds of them were stranded on the summit during a storm. Wiese has run the Boston Marathon three times. This year, he completed Boston and Fargo and is also scheduled to run the Twin Cities Marathon in October. A year ago, Wiese thought he might be done running all together. He had a ruptured disc in his neck and, while carrying a table over his head, smashed bones in his neck. He had surgery to fuse two of his vertebrae and also had a cage, bolts and pins installed in the reconstruction. Wieses doctor told him that the impact of running would be bad for his neck and that it might be best for him to stop. But something bigger told him to keep running. Wiese said his neck has gotten better and better, even with the marathon training. With 70s and 80s rock playing on his iPod, he runs the hills that surround Mankato, climbs the Good Counsel steps and works out on the treadmill at Anytime Fitness, trying to get in the best shape possible for todays race. You get in that endorphin-junkie zone  when you gotta have it, Wiese said. For me, thats what it is, a challenge. Right after youre done, on the finish line, you think, No more. Thats it. But the next day you wake up, and you gotta go again.